Candace H. Johnson-For Shaw Media Galia Castillo, of Antioch watches her daughter, Victoria, 2, listen to the song, "Itsy Bitsy Spider," during the Tiny Tots Halloween program at the Antioch Public Library District. Candace H. Johnson-For Shaw Media Levi Pauley, fifteen-months-old, of Trevor, Wis., dressed as Elmo and his grandmother, Rita Chernin, of Grayslake make a frame craft during the Tiny Tots Halloween program at the Antioch Public Library District. Candace H. Johnson-For Shaw Media Victoria Castillo, 2, of Antioch and her mother, Galia, make a Pumpkin Patch picture frame during the Tiny Tots Halloween program at the Antioch Public Library District. 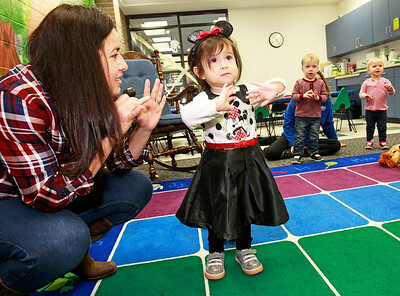 Candace H. Johnson-For Shaw Media Victoria Castillo, 2, of Antioch, Owen Sternberg, 3, of Trevor, Wis. and Audrey Sparrowgrove, 2, of Spring Grove dance to the music during the Tiny Tots Halloween program at the Antioch Public Library District. 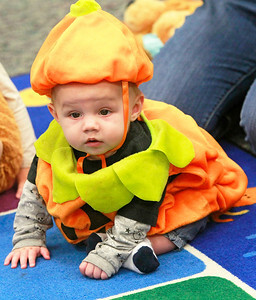 Candace H. Johnson-For Shaw Media Ethan Sparrowgrove, six-months-old, of Spring Grove, watches the kids play in the Tiny Tots Halloween program at the Antioch Public Library District. Ethan was at the library with his sister, Audrey, 2, and mother, Sarah. 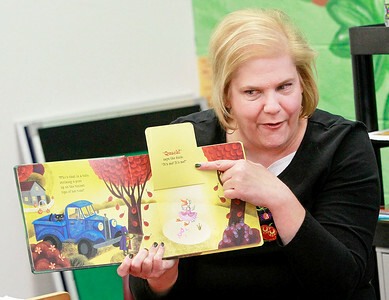 Candace H. Johnson-For Shaw Media Sandy Doetsch, children's clerk, reads the book, "Little Blue Truck's Halloween" during the Tiny Tots Halloween program at the Antioch Public Library District. 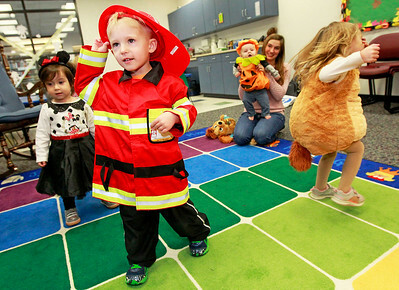 Levi Pauley, fifteen-months-old, of Trevor, Wis., dressed as Elmo and his grandmother, Rita Chernin, of Grayslake make a frame craft during the Tiny Tots Halloween program at the Antioch Public Library District.